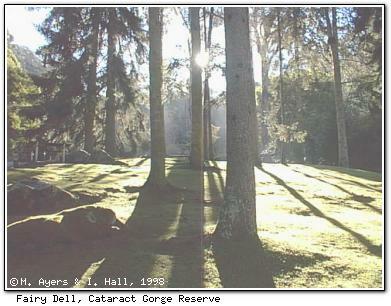 Cataract Gorge Reserve is arguably the best recreational area in the northern city of Launceston, located only 1.6 km (1 mi) from the city centre. The chairlift crossing the Gorge is the longest single span one in the world at 308m (924 ft) - a winter view from chairlift is pictured below. If chairlifts aren't your style, you can opt for the suspension bridge, pausing in the middle to watch the rapids far below. Activities undertaken in the Reserve include walking trails, fishing, abseiling, rock climbing and whitewater rafting. There is a swimming pool in the Reserve. 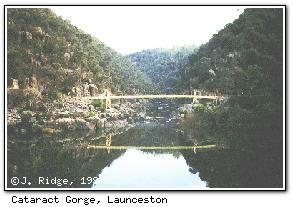 Further downstream you can cruise the Gorge in the paddlesteamer MV Lady Stelfox. Close to the Gorge is the Penny Royal World. The Penny Royal Watermill has a working cornmill, and is connected to the Penny Royal Gunpowder Mill by a restored tramline.